VP90 Formula X is the ultimate cleaner and protector for all types of machinery and equipment, it offers 100% protection from rust but also lubricates and cleans. 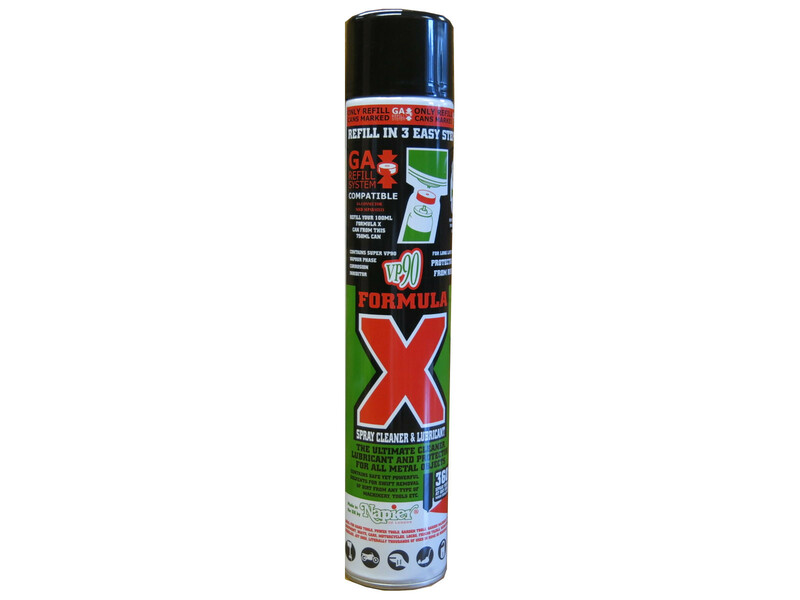 Use Formula X to clean power tools, hand tools, clay pigeon traps, garden equipment, marine engines, mowers, agricultural machinery, motor cycles, fishing gear, boats and cars. Formula X incorporates VP90 vapour phase contact inhibitors and contains a blend of powerful solvents to blast away dirt and grim, leaving a dense film of VP90 lubricant to provide a long lasting protection from rust. Ideal for loosening locked and seized parts, it will penetrate into all areas and the vapour phase and contact inhibitors will act to protect anywhere air can penetrate. The special refill system allows the handy pocket spray to be refilled at any time from the giant 750ml can. Simply connect the two cans together using the G.A connector (Full instructions on every can). The GA Connector is sold separately.